Eutrochium purpureum or Joe Pye weed is an herbaceous, late-blooming perennial native to much of the U.S. It is a wildflower and an herb that was used as an herbal remedy to lower fevers and other maladies. The plant goes by the common name Joe Pye weed, named after a Native American herbalist. The lance-shaped leaves grow in whorls around the otherwise green stem which is purple where the leaves attach. The compound flowers are composed of 5 to 8 florets and bracts in dusty rose to mauve, giving the appearance of large clusters. In some plants, the leaves and flowers can give off a vanilla-like scent. Joe Pye weed comes into its own in late summer to early fall. It is not uncommon to see Joe Pye weed growing along the roadside, which can be an enthusiastic spreader. Newer varieties are better behaved. There are taller versions, dwarfs, some with darker foliage and some with white flower heads instead of the familiar mauve. Most gardeners now use it to attract birds and butterflies to the garden and for its tall, stately grace at the end of the season. The corolla of each floret is tubular, making them popular with hummingbirds. Joe Pye weed grows best in partial shade. If grown in moist conditions, it can handle full sun, but it does not do well in hot, dry conditions. Joe Pye weed tolerates most soil pH. It is more particular about having adequate moisture. Keep your plants well watered, particularly when first planted and during dry spells. Do not let the soil remain dry for longer than a few days, especially during hot temperatures. The biggest problem growing Joe Pye weed is keeping it from getting dry. The leaf edges will scorch if the soil is allowed to remain dry for too long. Too much strong sun will tend to yellow the whole leaf. This plant is native to Nova Scotia south to the mountains of North Carolina and from Nebraska to British Columbia; it prefers the moist conditions of wetlands and marsh-like habitats. It is cold hardy, able to grow in U.S. Department of Agriculture zones 2 through 9. 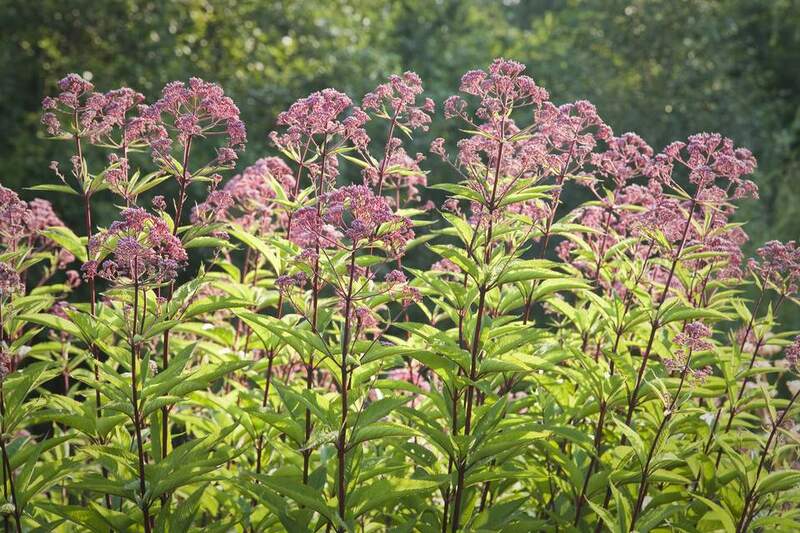 If planted in somewhat rich soil, like a woodland edge, Joe Pye weed should not need much in the way of fertilizer. Joe Pye weed blooms on the new season's growth, so cut the plants back hard to about 4 to 8 inches in the spring. You can keep your Joe Pye plants shorter by cutting the stems back by half in June. Cut back to just above a whorl of leaves. The plant will send out more stems and you should get more flowers on a shorter plant. Many varieties can be sown from seed. In fact, you will probably get more than enough volunteers from self-seeding. If you choose to start your own seed, it helps to stratify the seeds before planting indoors. You could also direct sow in the garden in the fall. Container-grown cultivated varieties can be found in most garden centers and catalogs. Plant at the same depth as it is in the container. Water well at planting time and keep watered until you see new growth and know the plant is established. Joe Pye weed is usually reserved for the back of a border, partly because it can get so tall, but also because it blooms late in the season. It can hide out behind earlier bloomers until ready for its moment to shine. With its large flowers, Joe Pye can become top heavy and flop over. Planting it behind a sturdier plant for the support it is a good idea. Joe Pye weeds height adds an architectural element to a billowy cottage-style planting. Contrast it with golden Rudbeckia and goldenrod, for an instant autumn scene. Since Joe Pye weed does best in slightly damp soil, it is wonderful planted alongside ponds and streams, but keep an eye on it, because if the conditions are ideal, it can get out of hand.